Kelly was a renaissance woman before women’s lib and was investing in property when she was single in New York City, the Hamptons and then Palm Beach. After moving from New York to Palm Beach, she purchased a wonderful home, refurbished it and added a painter’s studio to the property. At the same time, she invested in a condominium in Palm Beach, and with the Florida real estate boom, these properties escalated in value. All the while Kelly was working at the National Enquirer as their book editor, purchasing the rights to celebrity books and the latest best-sellers, she was traveling to Europe, New York and California. 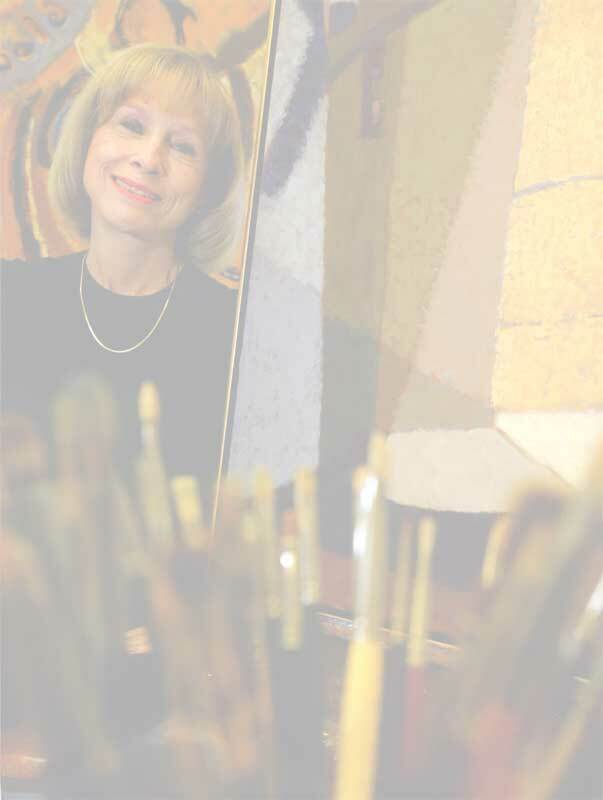 The position was jam-packed with lots of deadlines and hard work, but she managed to begin oil painting lessons at the Armory in West Palm Beach. Little did she know, she had tremendous talent in this medium and excelled quickly. She developed a signature style, which consisted of a Matisse-type look. Creating bold, colorful still lifes with marvelous patterned material and vases with flowers, fruit and possibly an unusual figurine, her watercolors, oils and gouache became sought after by the art collecting crowd. One day, Kelly approached the owner and founder of the National Enquirer, Generoso Pope, with a proposition she hoped he couldn’t refuse. That was she would work four days a week and have Fridays off to study her art. He didn’t believe she could do her job correctly in just four days but was willing to give it a try. After following this schedule for over a year and being successful with it, Kelly had another brainstorm. She would take her vacation time throughout the year and apply it to a day a week, giving her two days a week to study art. Again, she got her wish and thus began to work three days at the Enquirer and two days plus weekends either in her studio or at the Armory. It was also around this time, Kelly, who is from Michigan, had to make a trip home to visit her ill mother. While up north, her mother kept pestering her to see an old boyfriend, Bernie. Kelly refused, but her mother wouldn’t relent on her matchmaking. One day, Kelly ran into his mother, and she suggested she get together with her son. This time, Kelly agreed, and Bernie called and made a dinner date. Well, the rest was history, so they say, and Bernie and Kelly married. Bernie, who was getting ready to retire, moved to Florida, and he and Kelly continued to invest in property. However, this time, Kelly left the real estate matters to Bernie while she concentrated on her art. Now, she has retired from the Enquirer and has focused on her art career. Since 1995, Kelly has made a name for herself and has appeared on the front cover of Where Magazine, New York, announcing her New York shows. “Kelly’s work is especially noteworthy for its voluptuous color and for compositions reminiscent of Matisse.” Where Magazine, New York. Kelly has shown her work at both solo and group exhibitions. For years, she has been presented by Sherry French in Palm Beach and New York and is collected by corporations and private persons. Royal Cruise Lines has paintings by Kelly as does Pricewaterhouse Coopers. “Curtis Kelly’s exquisite still lifes are bold and colorful with a subtle, off-kilter perspective that gives them a dynamic vibrancy. Her beach scenes project a casual insouciance that belies her carefully considered composition.” Palm Beach Chic. Recently, Kelly has added another dimension to her existing repertoire by creating abstract oils. Her “Blue Venice” and “Venice” are outstanding examples of architectural abstracts and may be seen at Donna Tribby Fine Art in CityPlace, West Palm Beach. As time goes by, Kelly grows and expands as an artist and will be showing at RosettaStone Fine Art Gallery in Juno.